Vague and sloppy language, Orwell points out, can aid the writer who is trying to hide his real meaning from the reader. Deception is more difficult if one uses clear, straightforward language: when a remark is stupid, it will sound stupid. Orwell describes the deceptive use of the word “democracy”: “It is almost universally felt that when we call a country democratic we are praising it: consequently the defenders of every kind of regime claim that it is a democracy, and fear that they might have to stop using the word if it were tied down to any one meaning. Words of this kind are often used in a consciously dishonest way. That is, the person who uses them has his own private definition, but allows his hearer to think he means something quite different.” Orwell lists words similarly used “more or less dishonestly”: class, totalitarian, science, progressive, reactionary, bourgeois, equality. 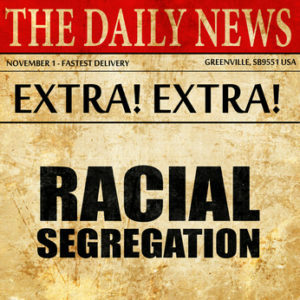 Consider today’s use of the word “segregation.” The word “segregation,” of course, conjures up the spectacle of George Wallace standing in a doorway at the University of Alabama, and of little black schoolchildren walking through crowds of hate-spewing white people. Everyone today opposes racially segregated schools. This is simply false. There are no segregated schools in the US, and there haven’t been for decades. The American Heritage Dictionary defines segregation as 1. The act or process of segregating or the condition of being segregated. 2. The policy and practice of imposing the social separation of races . . . . There is not one public school in the United States designated “black” or “white.” Any child, black or white, living in a school district can attend that school. In 1950, black children faced true segregation, often traveling past a nearby “white” school to get to a more distant “black” school. That is not happening anywhere. There are no segregated schools in America. Using the word “segregation” conceals what is really being sought: Moving children around to produce a preferred mix of races at schools. Speaking thus plainly would lead to questions: What mix of races is considered preferable? Who decides? And how is that racial mix achieved? There are arguments in favor of forcibly moving children for such a purpose, but making those arguments is more difficult than shouting “segregation!” The vague and artful use of language – word ploy — thrives all these years after Orwell’s essay. *Word Ploy. A Word Ploy is deceptively using a repugnant word in order to imply that something one dislikes is identical in repugnance: Applying the word segregation to “predominantly black/white” schools implies that the existence of such schools is the equivalent of true segregation. A Word Ploy is also deceptively using a commendatory word to imply that something one likes is identical in value: Orwell’s example was applying the word democracy to an undemocratic regime, to imply that they are equally free. I got this web page from my pal who shared with me regarding this web page and now this time I am visiting this website and reading very informative content here.